The magazine is printed in 44 full colour pages of high quality gloss paper. 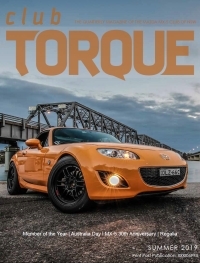 Club Torque features all the latest reports on club events including drive days, weekend escapes, social events, and motorsport, in addition to technical tips, media releases, and general articles of interest to the MX-5 community. 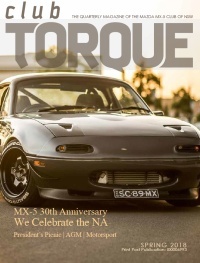 The latest three editions of Club Torque are available by clicking on the cover images below. For a complete collection of all previous editions of our Club magazine, please visit the Library. A limited supply of Back Issues are available for purchase. Club Torque is produced by Mel Keller our Club Torque Editor and Publications Officer. Mel is responsible for deciding what goes into the magazine, collecting the content each quarter, writing special articles, and the magazine design & layout. Club Torque is approved for Print Post and the publication number is 100006993.